Three, eleven, twenty. Six, twenty-six, fifty-seven. Nine, thirty-seven, seventy-seven. Minus-two, plus-ten, plus-twenty-seven. Those were the first three seasons in the NHL for Evgeny Kuznetsov. The progression suggested big things were in store for the 24-year old Russian who was firmly entrenched as the second line center for the Washington Capitals. However, fate has a way of intervening, and the rungs on the ladder of success might give way from time to time. 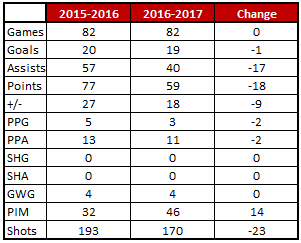 It might have been a hangover from a disappointing 2016 postseason, or it might just have been a hiccup on the development path, but Kuznetsov had a slower than expected start to the 2016-2017 season. He had a decent, if unremarkable, first ten-game split for the season, going 1-5-6, plus-4, in those ten games. But rather than pulling himself up that ladder of performance, he found out it had those splinters, sliding down in his second ten games split (2-1-3, plus-1) and failing for the only time all season to record a goal in a ten-game split when he went without one in his third ten-game split (0-8-8, plus-1). That absence of goals in his third ten-game split was part of what became a 17-game streak without a goal (Games 20-36). He did have a six-game points streak in there (eight assists), but he was dragging an 0-for-38 shooting mark along. Then, he flipped the switch. Over a two-month span covering 27 games starting on January 3rd, Kuznetsov went 12-20-32, plus-15, tied for second over that period in points. What made that performance so noteworthy was that Kuznetsov did it while logging the fewest minutes of ice time per game (16:22) of any of the top-25 scorers during that span of games. But it didn’t last. Over his last 19 games, Kuznetsov was a relatively quiet 4-4-8, minus-2. The odd part of that finishing kick was how weak it was against weak teams. In those last 19 games, he and the Caps played eight games against teams that did not reach the postseason, and Kuznetsov was just 1-1-2, minus-3, both his goal and assist coming in one game, a 5-3 win over the Colorado Avalanche on March 29th. Kuznetsov’s offensive contributions matter, as one would expect for a second-line center and part of the second power play unit. Washington was 14-3-0 in games in which he recorded a goal, 33-7-1 in games in which he recorded a point. Unsurprisingly, they were 15-1-0 in games in which he recorded multi-point games. The Caps’ record when he produced shines a bright light on just how important the second line center position is for this club, especially given that the Caps had such a time trying to fill that role before Kuznetsov claimed it. 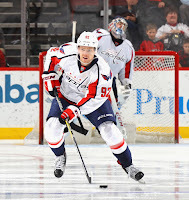 Fearless’ Take… At times, one forgets how young Kuznetsov is still. Over the last three seasons he is one of four centers 24 years of age or younger to record at least 170 cumulative points (Mark Scheifele, Ryan Johansen, and Sean Monahan are the others). He is one of 11 players drafted by the club in the history of the franchise to record at least 180 cumulative points in his first four seasons with the Caps. He finished the season as the third-youngest skater on the club among those 18 skaters appearing in at least 40 games. Cheerless’ Take… Here is a number for you: “18.” The Caps were 8-10-4 in games in which Kuznetsov skated more than 18 minutes last season. On the other hand, the Caps were 24-1-1 in games in which he skated fewer than 16 minutes. Sure, that might be that whole “roll four lines” thing, but it does stand out. Odd Kuznetsov Fact… Faceoffs are more an “attention to detail” sort of thing than a factor that determines wins and losses (until you win or lose one late in a game that leads to a deciding goal), but in Kuznetsov’s case, that seemed to be the case in 2016-2017. In games in which Kuznetsov was better than 50 percent on draws, the Caps were 12-4-1 (.735 points percentage). In games in which he was under 40 percent, they were 18-6-3 (.722). And, in those games win which he finished between 40 and 50 percent, inclusive, the Caps were 25-9-4 (.711). This was the contest that propelled Evgeny Kuznetsov to his mid-season run of individual success. The game itself was a goal-fest, starting with a Justin Williams power play goal 74 seconds into the game, a play that started with a Kuznetsov feed to Dmitry Orlov, whose shot clicked off Williams and past goalie Frederik Andersen. The teams didn’t let up from there, exchanging goals at a brisk pace with Toronto taking a 3-2 lead to the first intermission. The Leafs extended their lead to 4-2 going into the second intermission. In the third period the Caps mounted a comeback, starting with a Kuznetsov goal 2:20 into the period, converting a feed from Marcus Johansson from the low slot into a one-timer past Andersen. Dmitry Orlov got the Caps even just over a minute later, but Toronto grabbed back the lead mid-way through the period. Washington tied the game one last time when John Carlson collected a loose puck in his end and fed Kuznetsov heading down the middle. Getting behind the Toronto defense, Kuznetsov tried a backhand from in close, but he couldn’t get a good swipe at it with Tyler Bozak backchecking. Andersen couldn’t locate the puck, though, and Kuznetsov chipped it back in front where Marcus Johansson and John Carlson got chances at it, Carlson potting the goal with less than seven minutes left. In overtime, the Caps made short work of things. Jay Beagle won the draw to open overtime, then went off for Alex Ovechkin. Kuznetsov fed the puck from the right wing wall to John Carlson, who fed it across to Ovechkin for a one-timer that beat Andersen just 22 seconds into the extra frame. Kuznetsov finished the game with a goal and three assists, his four points being his season best, his third career game with four or more points. Sometimes, things just seem that little bit out of sync in, well, everything. Such was the case for Kuznetsov when the Caps visited the Ottawa Senators in late January. For the Caps and Kuznetsov, it was the back half of a back-to-back set of games, the Caps having beaten Carolina, 6-1, the previous night. They and Kuznetsov left their offense in Washington. Ottawa got out to a 2-0 first period lead and never looked back in a 3-0 win. 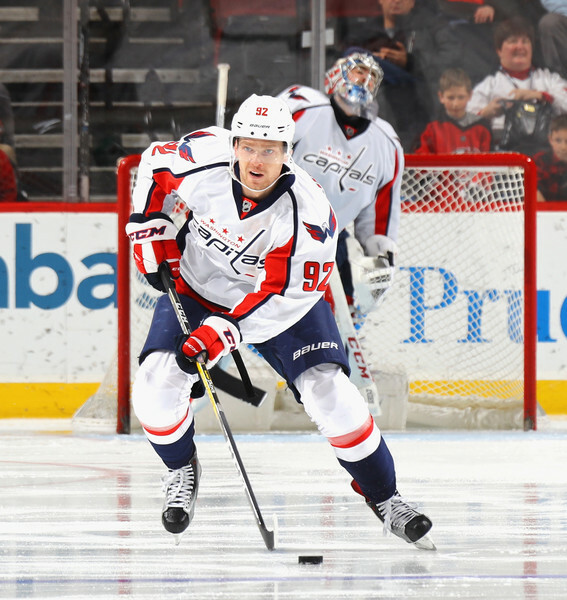 For Kuznetsov it was an all-around “meh” game. In 15:33 if ice time he had more minor penalties (two) than shots on goal (one), lost eight of 13 faceoffs, and was otherwise unheard from on the score sheet. It was the only game in a nine-game span in which he failed to record a point. Evgeny Kuznetsov had pieces of a fine season. He also had pieces of an indifferent one. The start and finish to both his regular and postseason dragged down what might have been another fine season overall. Kuznetsov is an indispensable element to the Caps’ success going forward, but the first order of business in fulfilling that role will be to extract the splinters from his hands from sliding down a rung or two on the career ladder and being more consistently productive than he was at times in 2016-2017.